The NBA Playoffs certainly haven't gone the way many thought they would but a Finals matchup which features LeBron James and the Heat against Dirk Nowitzki and the Mavericks shouldn't disappoint many fans. Both teams have compiled impressive 12-3 records in the postseason thus far and although they've been involved in some close games, it's hard to deny that the Heat and the Mavericks have been the two best teams in the league for the last few weeks. There are plenty of exciting matchups and interesting story lines that will play out during this series and I've come up with 10 questions whose answers will decide which team hoists the Larry O'Brien Trophy and which team goes home disappointed. 1. Can Tyson Chandler stay out of foul trouble? It's no secret that the rugged play of Tyson Chandler has helped to change the culture of a previously soft Dallas Mavericks team. Chandler's 7'1'' frame combined with his length and toughness was a huge asset for the Mavericks all season long and was especially valuable against the Thunder in the Western Conference Finals. His presence around the basket from a defensive standpoint is a game changer for a Mavericks team that doesn't excel on that side of the court and it's pretty clear that Dallas is not the same when their big man is on the bench. Chandler has done a decent job of avoiding unnecessary fouls during the playoffs thus far and if the Mavericks are going to contend with the likes of LeBron and Dwyane Wade driving to the basket, they're going to need Chandler in the game. It's been an incredible run for the Mavericks through the 2011 postseason and while they've managed to compile a 12-3 record overall, they're just 1-2 when Chandler has committed five or more fouls. Showing just how important his presence is to this team, even if he's not racking up huge numbers. 2. How will the Heat attempt to guard Dirk Nowitzki? 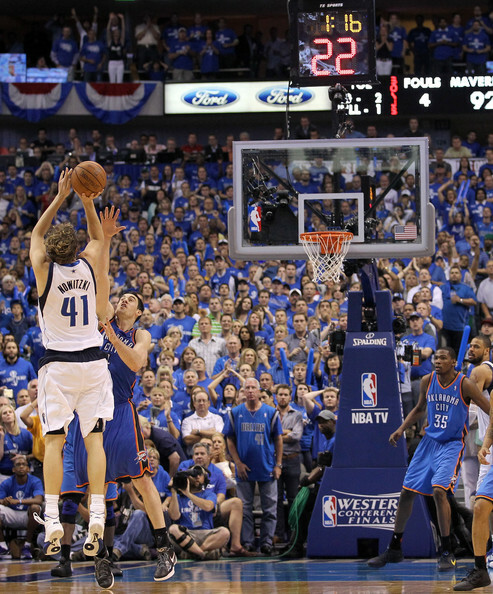 Even if you didn't watch the Western Conference Finals, you probably heard about Dirk Nowitzki's amazing play. The German import's 32 points per game on 55 percent shooting coupled with countless clutch baskets, were invaluable to the Mavericks and are a huge reason why this team is in the NBA Finals. 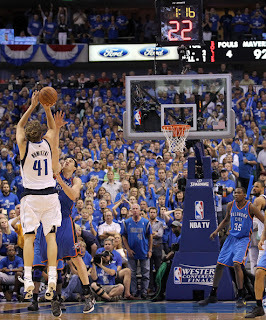 Nowitzki abused any and all defenders that the Thunder threw at him, and whether it was making a young and athletic Serge Ibaka look foolish or treating Nick Collison like he was a cardboard cut-out, there was no stopping Dirk in that series. In the NBA Finals it will be up to the Heat to try and slow down Nowitzki and prevent him from completely dominating the series. Erik Spoelstra has plenty of options at his disposal and how he chooses to use the players on his team to defend Dirk might be the single most important match up of the NBA Finals. Chris Bosh has the requisite size and length to bother Dirk's midrange game and he figures to get the first crack at slowing him down. Although he's working his way back from injury and is only 6'8'', Udonis Haslem is a gritty player who did a fantastic job defending Dirk in the 2006 NBA Finals and should get another chance to try and replicate that success in this series. Joel Anthony has the strength to bother Nowitzki especially if the Heat decide to front him and deny the ball. Anthony has had more success as a help defender this season and has also struggled with foul trouble at times, but he's another big body who could see some time on Nowitzki during this series. 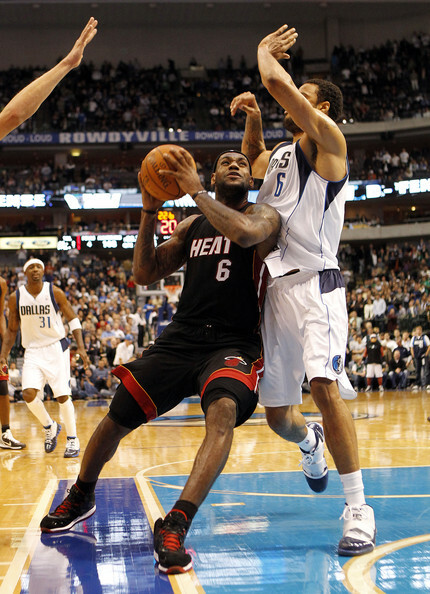 Finally, LeBron James will undoubtedly be used to defend Dirk in some capacity during the Finals. LeBron's incredible size, athleticism, and strength allow him to guard pretty much any player in the NBA effectively and it's probable that Spoelstra uses him against Dirk in the fourth quarter in much the same way he used LeBron against Derrick Rose in the Eastern Conference Finals. This is the matchup everyone wants to see and LeBron could easily be the Heat's best option to try and slow down the unstoppable offensive force which is Dirk Nowitzki. 3. Is Dwyane Wade fully healthy? Lost amid the Heat's impressive run to the NBA Finals was the deteriorating play of Dwyane Wade during their most recent series against the Chicago Bulls. His series averages of 18.8 points, 6.4 rebounds, and 2.2 assists are solid but we're talking about a player who went for 25, 6, and 4.5 a night during the regular season not to mention Wade shot just 40 percent from the field in the Eastern Conference Finals and committed 4 turnovers per game. Wade's uncharacteristic play and tendency to disappear at times during the Heat's series against the Bulls has prompted many to ask if the star shooting guard is struggling through an injury. The question has been asked on multiple occasions over the last week and while Wade has denied that he is injured, many are speculating that his surgically repaired left shoulder has been giving him trouble since he landed on it during the Heat's first round series against the 76ers. Wade may very well be fine and his relatively poor performance against the Bulls might have been nothing more than a little fatigue and a few bumps and bruises slowing him down after another grueling NBA season. Heat fans surely hope this is this case because it will be very difficult for Miami to beat the Mavericks with Wade struggling like he did against the Bulls and perhaps after four full days of rest before the Finals start, Wade will return to form against Dallas. 4. Can Chris Bosh continue his inspired play? With all due respect to the criticism that LeBron has received since he joined the Heat, Chris Bosh has arguably been the most maligned player in Miami. Many criticized the 6'11'' power forward's heart and toughness throughout the regular season and Bosh was under heavy fire after his playoff series against the Boston Celtics in which he averaged just 12.8 points per game on 40 percent shooting. But just when most people were ready to write Bosh off completely and began referring to the Heat's big three as the big 2.5, his performance against the Bulls was nothing short of stellar. Bosh scored at least 20 points in four of the five games of the Eastern Conference Finals which included two 30-point efforts and saw him shoot 60 percent from the field and 91 percent from the charity stripe. He was once again a deadly offensive threat from midrange and was also much more confident and tough around the basket, taking it strong and finishing after contact. Adding the play of an inspired Chris Bosh to what Dwyane Wade and LeBron James already bring to the table makes the Miami Heat nearly unbeatable, and if Bosh can keep it up, it's going to make life very difficult on the Mavericks during the NBA Finals. 5. Can the Mavericks bench continue to dominate? One of the biggest reasons why the Mavericks have enjoyed so much success in the playoffs thus far is because their bench has given them a huge advantage. No one the Mavericks have faced has had much of an answer for Jason Terry, J.J. Barea, and Peja Stojakovic, who have all made their presence felt off the bench. Terry has been nearly lights out from the perimeter and has been feasting off of open looks that are generated by the opposing team doubling Dirk at every chance they get. Despite the fact that he's been coming off the bench, Terry plays starters minutes and is the Mavs second leading scorer and second most dangerous offensive weapon. Barea and Stojakovic have been nearly as good, and the instant offense they've provided for Rick Carlisle has allowed Dallas to either preserve or extend leads when the starters are getting a breather. Even Brendan Haywood, who nearly spontaneously combusted after Kevin Durant posterized him last round, has provided Dallas with another big body who can give them solid production around the basket. In the NBA Finals, it will be crucial to the Mavericks success that Terry, Barea, Stojkakovic, and even Haywood are giving the team productive minutes as it's doubtful that the starters will be able to trade punches with what LeBron, Wade, and Bosh will be able to do on both sides of the floor. 6. Will the Heat be able to execute in crunch time? Whether or not the Heat could execute in crunch time was one of the biggest questions that this team has faced for the majority of their first season together. After ousting the Bulls in five games and playing very well down the stretch (especially in game five) in most of those contests, it seems that Miami has answered this question once and for all. 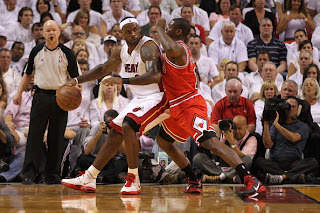 The play of LeBron James, in particular, has come under intense scrutiny during these situations but his jaw dropping performance in the fourth quarter of game five, which almost single handedly ended Chicago's season, all of a sudden has everyone comparing him to Michael Jordan. At the same time, it's one thing to execute against a young Bulls roster that was essentially shell shocked because the Miami team they were facing was nothing like the one they saw in the regular season, and it's another thing to do so against a veteran Dallas team. I'm not taking anything away from what the Heat accomplished during their series against the Bulls, but everyone saw how the Mavericks experienced lineup had absolutely no problem making the Thunder look terrible in these situations while they thrived under the pressure. It will certainly be a test to see how far the Heat have come in these instances when they go up against a team who lives for late game situations. Another thing to consider is the fact that perhaps Wade's struggles actually made the Heat better in crunch time. Instead of Wade and LeBron awkwardly trying to figure out who would take the last shot like a couple of 13 year-olds stepping on each others toes at a school dance, both LeBron and Wade (and everyone else for that matter) knew that LeBron should be taking the last shot. If Wade returns to form in the Finals it will be interesting to see how his re-emergence affects the Heat's late game dynamic that seemed to be working so well against the Bulls. 7. Will the Heat's role players continue to give them productive minutes? Obviously, the strength of this Miami team lies in the brilliance of LeBron, Wade, and Bosh, but the team's playoff success has absolutely been aided by the emergence of certain role players. Joel Anthony's shot blocking was crucial during the Eastern Conference Finals and although he should never be passed the ball under any circumstance, his help defense will continue to be important in the NBA Finals. Udonis Haslem made his triumphant return to the Heat lineup just a few games ago and it was clear that this team enjoyed having his hustle and toughness back on the court. As I've already discussed, Haslem will most likely be given an opportunity to guard Dirk Nowitzki at some point during this series and his ability to contribute as a defender as well as potentially hit a few jumpers may very well propel this team to a title. Mike Miller has had a rough season dealing with injuries and was essentially a non-factor in the playoffs before the Eastern Conference Finals began. But Miller saw his minutes increase dramatically in the Heat's last four games against the Bulls and he managed to make a few impact plays. Miller's hustle has made a difference on the glass and although his shooting touch has been severely limited due to an injured thumb, he finally hit a couple of jumpers in the last two games against the Bulls, a trend which the Heat are hoping will carry over into the Finals. The Heat's role players probably won't grab any headlines during the Finals but when they are contributing it makes life much easier for the big three. Against the Mavericks, the Heat stand a much better chance if the likes of Miller, Haslem, Anthony, and Mario Chalmers are chipping in. 8. 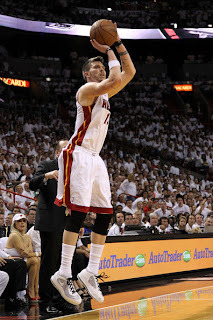 How much of a factor will the Heat's superior athleticism play? While these two teams seem to be pretty evenly matched overall, the Heat certainly have a big advantage when it comes to athleticism. The Heat are a younger team that can push the ball up the court and take it strong to the basket, both of which figure to give Dallas problems during this series. We already saw the Heat use their athleticism to their advantage against an older Boston Celtics team in the playoffs and if they're able to get out in transition again in the Finals, they will have a major advantage. We also saw the Mavericks struggle against the athleticism of the Thunder in the Western Conference Finals and although they ended up winning the series in just five games, the Thunder's athleticism put them in favorable positions for most of the series and they failed primarily because they couldn't execute in crunch time. Dallas is an older team that has learned to play smarter and more efficiently than their opponents but against the Heat, it's going to be very interesting to see if they can once again overcome a much more athletic team and play to their strengths. 9. Can Jason Kidd impact the series in a number of different ways? 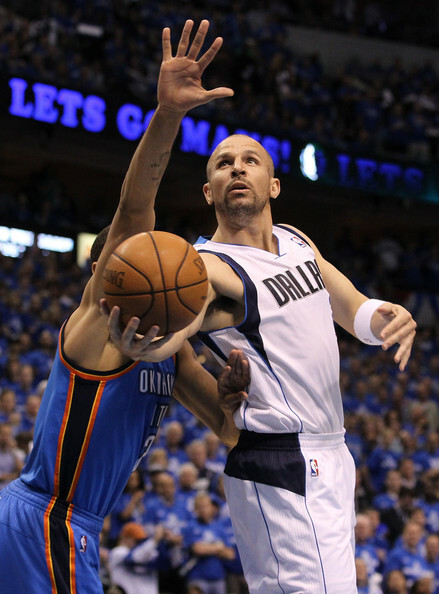 Dirk Nowitzki has grabbed the headlines but Jason Kidd has seemingly been everywhere for the Mavericks during the playoffs. Whether he's hitting that big three, making plays on defense, or setting up teammates for easy looks, Kidd has done a little bit of everything for Dallas and been an invaluable leader for this team. In addition to all of ways he has made a difference for the Mavericks thus far, Kidd has also played the kind of mistake free basketball that you would expect from a 38-year old. He committed just 10 turnovers and eight fouls during the Mavs five game series against the Thunder and as he's done for most of his career, Kidd continued to make the right decisions when the game was on the line. Against the Heat, Jason Kidd will have to impact the game in a number of ways and continue to play mistake free basketball as it would seem that the Mavericks have very little room for error against a star laden Miami lineup that is clicking at the right time. While the Heat have some very talented players on their roster, they won't have an answer for the kind of production Kidd will be giving the Mavericks and if the veteran point guard can make plays on both sides of the court, it will be a big boost for Dallas. 10. 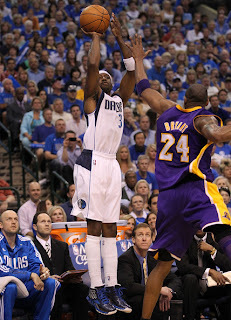 Will the Mavericks continue their hot three-point shooting? The Mavericks don't have as much star power as the Heat, nor are they as young or athletic as the team they will be facing in the Finals. But the great equalizer in basketball, has and always will be the three pointer, which the Mavericks have been deadly from during the playoffs. As a team, Dallas is averaging nine three-pointers per game while shooting nearly 39 percent from behind the arc and players like Dirk Nowitzki, Jason Terry, Jason Kidd, J.J. Barea, and Peja Stojakovic have all been hot. Nowitzki is hitting over 50 percent of his long range shots and Terry has been nearly as good, connecting on 46 percent of his. I don't care how good the other team is, if you can hit long range shots the way Dallas has for most of the playoffs, you're going to have a chance to beat anyone. The Heat will no doubt be focusing their defense around trying to prevent Nowitzki from having another huge series, but if they're forced to double him it's going to lead to more open shots which the Mavericks have converted with machine-like consistency during their postseason run. On the other hand, the Heat have been an average three-point shooting team during the playoffs and they've averaged a little over five makes per game with just a 32 percent success rate. If the Mavericks can continue their hot three-point shooting it will make for a very interesting series and could potentially turn the tide in their favor.